Rounding out the Signature Stat Spotlight series, we take on wide receivers and the advanced stats that play into evaluating pass-catchers at the NFL and FBS level. Yards per route run is the crown jewel of PFF’s advanced stats for wide receivers. Dividing total receiving yards recorded by the number of routes run in a given game, season, career, etc. provides a great one-number summary of just how efficient a receiver is on a down-by-down basis. Receivers need to create separation, earn targets, secure passes and generate yards after the catch to have a high yards per route run figure, making it a product of multiple factors and, as a result, a fantastic advanced stat made available to all of PFF’s ELITE subscribers. In addition to yards per route run, PFF tracks passer rating when targeted, drop rate, deep receiving statistics and slot production in Premium Stats 2.0. Outside of ELITE, PFF also charts contested targets, receptions, etc. and forced missed tackles and yards after contact on receptions. Julio Jones has been the league’s most efficient wide receiver over the past four seasons, and that’s not really an argument. 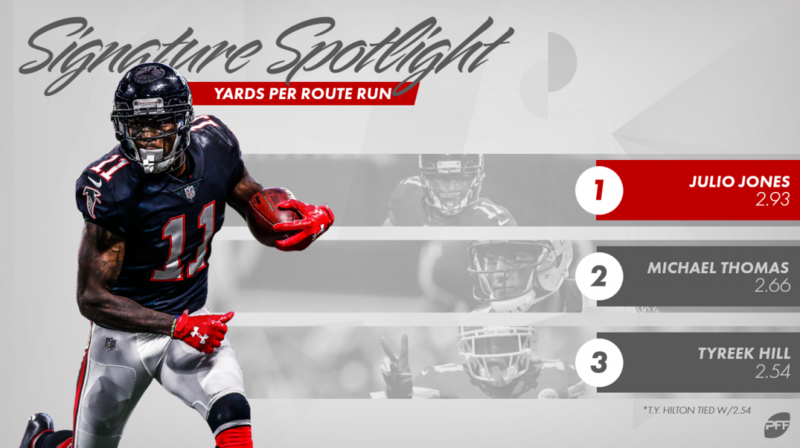 The Atlanta Falcons standout has finished first in yards per route run in each of the past four seasons (2015-18), most recently finishing at his league-high mark of 2.93 in 2018. He finished above 3.00 in yards per route run in each of the three years prior, as well. Other notable names finished inside the top-five in PFF’s yards per route run metric, including Michael Thomas (2.66), T.Y. Hilton (2.54), Tyreek Hill (2.54) and DeAndre Hopkins (2.51). On the opposite end, Cincinnati Bengals’ John Ross and Pittsburgh Steelers’ rookie James Washington tied for last in yards per route run (0.57) among the 82 wideouts with at least 300 routes run in 2018. Moving to passer rating when targeted, Seattle Seahawks’ Tyler Lockett did the impossible, recording a perfect 158.3 passer rating when targeted across his 459 routes run and 65 targets. He is the only wide receiver in the PFF era (2006-Present) with 50-plus targets and a perfect passer rating when targeted in a single season, an impressive feat, to the say the least. To meet such a mark, Lockett needed to catch a lot of touchdowns, create separation more often than not to avoid potential turnover-worthy throws and pull off big gains with each reception. He did just that, scoring 10 touchdowns and picking up 10 or more yards on 63.16% of his receptions. Lockett also finished with 520 receiving yards on passes of 20-plus air yards, which ranked fourth in the NFL this past season, but no one came close to the cheetah in Kansas City when it came to deep receiving yards. Kansas City Chiefs’ Hill paced the receiver position with 754 deep receiving yards, while Tampa Bay Buccaneers’ Mike Evans ranked second on the list with 543 deep receiving yards. Hill is the best deep threat in the NFL, and it’s not even close. Here, Hill takes advantage of a free release at the line of scrimmage and finds a wide-open soft spot in the Pats’ zone coverage for a deep reception. He turns on the burners shortly after the catch and beats the brakes off of Duron Harmon for an untouched, 75-yard touchdown. Hill also left all slot receivers in his wake with his ability to dominate from an inside alignment. Among the 31 wide receivers with at least 200 routes run from the slot, Hill ranked first in yards per slot route run at 3.28. None of the other 30 receivers finished with a yards per route run average above 2.00. Going from the big-play threats to the sure-handed doesn’t take a significant stride, as Lockett was one of two receivers with 50-plus catchable targets and zero drops in 2018. However, the man he shares the feat with had more than double the number of catchable targets. Hopkins didn’t drop any of his 115 catchable targets in 2018, giving him a perfect 0.0 drop rate. He’s the first receiver in the PFF era with such a high volume of catchable targets and zero drops. Catches like this help, of course. Hopkins’ name comes up again when discussing the league’s best receivers in contested catch situations, as he ranked fifth in contested catch percentage (58.1) among the 28 wideouts with 20 or more contested targets in 2018. However, it’s Hill (again) that takes the cake in this advanced stat. Hill caught 13 of his 20 contested targets for 12 (!!) touchdowns and 524 yards, good for a position-high 65.0 contested catch percentage. After beating Sam Shields off the line with ease, Hill catches the underthrown pass from Patrick Mahomes through contact in the end zone for a touchdown. Carolina Panthers rookie wide receiver D.J. Moore and new Philadelphia Eagles receiver Golden Tate each finished with a 0.31 forced missed tackle per reception average in 2018, sharing the position-high. But it was Moore that had the lead to himself in yards after contact per reception (5.06) and yards after the catch per reception (7.91). In the play above, Moore turns a contested target and contact at the catch point into a long gain with his YAC ability. To continue to learn more about PFF’s advanced stats, subscribe to PFF’s ELITE subscription to dive into the numbers yourself throughout the offseason and into next season.